A woman has died after falling from Texas Giant at Six Flags Over Texas yesterday (19th July, 2013). Several news reports quote witnesses in the queue as saying that the woman was worried that her restraint was not properly fastened, but ride operators assured her that she'd be fine. Whilst details of the incident are unclear, it is thought that her restraint opened mid ride, and she was ejected as the train turned round the first corner. The area around the ride was closed off to guests following the incident, but the rest of the park remained open. The coaster will remain closed whilst the investigation into the incident is still ongoing. The Texas Giant closed before the end of the 2009 season on 1st November, 2009, for extensive renovations which took the entire 2010 season to complete. The cost to renovate the ride was approximately $10 million. 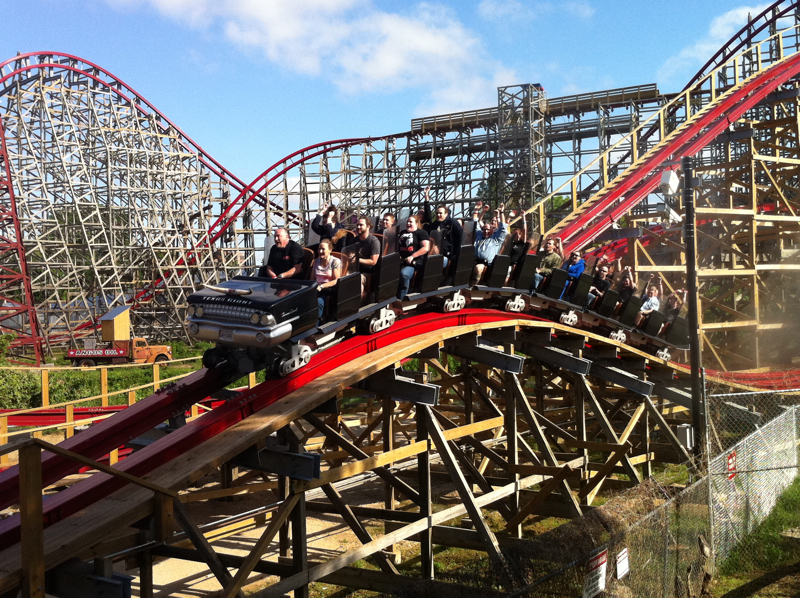 The renovations involved the removal of the wooden track and replacement with Rocky Mountain Construction's I-Box steel track and new Gerstlauer trains. The Texas Giant reopened in 2011. A tragic theme park incident, which possibly could of been avoided if the operators had listened to the woman. This is sad news, and I do feel really sorry for the family of the woman. It just makes you laugh that the only one of these RMC wooden coasters that doesn't have an inversion is the one which has the accident. Rocky Mountain Construction (RMC) have made a post on their facebook like page. Rocky Mountain Construction Facebook wrote: RMC is deeply saddened by the tragedy that occurred this evening in Texas. First and foremost, our heartfelt sympathies and prayers go to the family and friends involved during this difficult time. Currently we do not have any comments regarding specifics of the tragedy. We are working diligently to gather facts and understand exactly what took place. We appreciate your patience and once again our condolences go to the family and everyone involved. Woops, that's not good. This definitely sounds like the ride op's fault though for not making sure the restraint was in properly. If I was that ride op, if a customer was complaining, I'd go check the restraint and if they're still complaining, try and push it in further. If I was also a ride operator I would to also double check if they think it is bit lose or not locked properly. This is certainly tragic. The ride operators are stupid, if someone says their strap is loose it should be checked no matter what. Seriously hope these people get sued. I personally think it is very likely that the park will get sued for this and the person who was operating it will probably get fired and probably fined for neglect. I also don't think Texas Giant will be reopening anytime soon. They almost definitely will get sued for this. There is no way that the ride op will get off lightly either and will probably end up with him being fired and not being allowed back ever. I have no doubt that the park will get sued for this. But I wonder which members of staff would be more in trouble the person checking the bars or the actual ride operator, then again the whole team that was operating the ride at the time of the inicident could be fired. According to the Guardian Gerstlauer are sending a officials to Six Flags Over Texas to inspect the ride, these would seem logical because RMC did not make the trains and can't be blamed or penalized for something which they never did. Guardian wrote: A German roller coaster maker is sending officials to a Texas amusement park to inspect a ride after a woman fell to her death. Tobias Lindnar, a project manager for Gerstlauer Amusement Rides, told the Dallas Morning News the company would investigate what led to Friday's fatal accident at Six Flags Over Texas. "I'm sure there's no safety bar that is broken," Lindnar told the newspaper by phone on Saturday night from Germany. Lindnar said Gerstlauer had never had problems with car safety bars on any of the roughly 50 roller coasters it had built around the world over the past 30 years. "We will be on site, and we will see what has happened," he said. Iron Rattler has also been closed at Six Flags Fiesta Texas whilst the investigation at Six Flags Over Texas happens. Texas Giant's restraints use a hydraulic system meaning that the restraints do not "click when being lowered." Trains cannot be dispatch without green light indicator on-board the train for restraints.